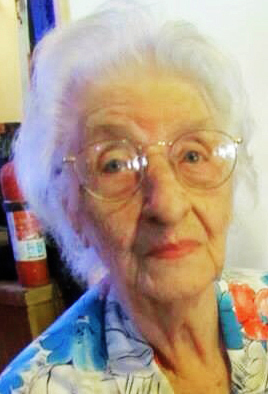 COLUMBIANA–Mary Alexander, a resident at St. Mary’s in Columbiana, recently observed her 100th birthday. She was born Aug. 15, 1918, in Steubenville, the daughter of the late John Allen O’Dell and Mary Alice King O’Dell. Mrs. Alexander graduated from Leetonia High School in 1936. 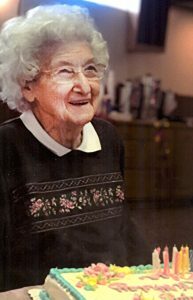 She married Harold Alexander on June 12, 1937, and was a homemaker, celebrating 70 years of marriage before her husband passed away in 2007. She is a member of Robbins Memorial Methodist Church in Washingtonville and sang in the choir and taught Sunday school when she was younger. She liked to crochet and knit and work with her flowers in her flower garden. Mrs. Alexander has three children, Donna (the late Claude) Minehart of Columbiana, Harold (Kristy) Alexander Jr. of Alliance and Kenneth Alexander of Salem; nine grandchildren;13 great-grandchildren; and six great-great-grandchildren.